The 7 layer salad is a make ahead salad that looks as good as it tastes. If you haven't tried it yet, gather up your ingredients and follow this classic recipe. 7 layer salad looks best when prepared in a glass bowl so your guests can see the individual layers and appreciate all your work. If you don't have a glass bowl, any medium sized bowl will work just as well. As the name implies, your salad will be made in layers (seven of them) rather than being tossed. Salads made like this are called composed salads. 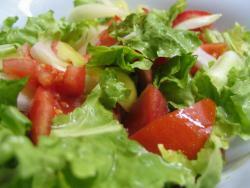 Other composed salads are the Cobb salad or the Frisée salad. Composed salads take a bit more effort than tossed salads but they present very well and are worth the effort. Generally, 7 layer salads are topped with a mixture of mayonnaise and sugar. This mayonnaise mixture is spread completely over the top of the salad to seal it. This prevents the ingredients from oxidizing while the salad chills. While this is a great quick fix solution, I like to use a homemade low-fat ranch dressing. I think the flavor is better and low-fat makes more sense to me with a salad. Place everything but the parsley and chives into a food processor or blender and puree. Pour into a bowl and add the chives and parsley. Taste and adjust for flavor. 1 head of romaine lettuce cut into 1 inch squares, washed and dried. Place each ingredient into the bowl in any order that you like. I like to finish off with the spinach so it's the top layer. Spread the dressing over the top of the salad, making sure that it touches the edges of the bowl sealing the salad. Cover the salad with plastic wrap and refrigerate for a few hours. Two cups of mayo mixed with 1 tablespoon of sugar is a good, quick-to-make dressing substitute. Substitute chopped tomatoes or sliced mushrooms for any of the other ingredients. Substitute your favorite shredded cheese for the cheddar. The 7 layer salad has reached almost epic status as a potluck dish, so keep this recipe handy. You never know when you'll need to make a batch to take to a get together, or simply make it to please your family.